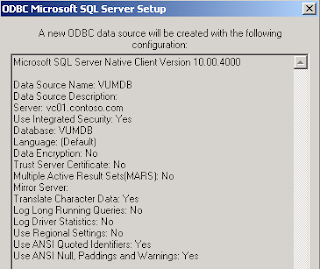 Assuming the SQL server 2008 and vCenter server are installed in the same server. Now, I have to install VMware update manager in the server which are installed SQL server 2008 and vCenter. 1. At VC01, log in as vcadmin. 2. Launch "SQL Server Management Studio", click "Connect". 3. 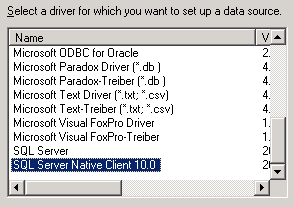 Right-click "Databases", select "New Database". 4. 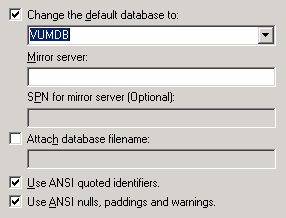 Next to "Database name", type "VUMDB". 6. Expand "Security > Logins", right-click "Contoso\vcadmin", select "Properties". 7. At left pane, select "User Mapping". 9. Next to "Default Schema", type "dbo". 10. 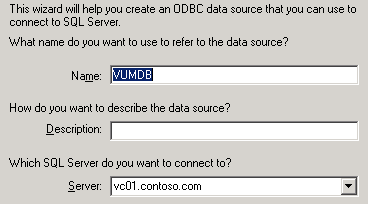 At "Database role membership for: VUMDB", check "db_owner". 12. Close "Microsoft SQL Server Management Studio". 13. Launch "Windows Explorer", navigate to "%Systemroot%\SysWOW64". 15. Select "System DSN" tab, click "Add". 16. 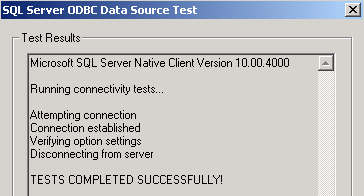 Select "SQL Server Native Client 10.0". 18. Next to "Name", type "VUMDB". 19. Next to "Server", type "vc01.contoso.com". 21. Check "Change the default database to", select "VUMDB". 24. Click "Test Data Source". 25. Click "OK" three times. 26. Insert VMware vCenter 4.1 DVD, click "vCenter Update Manager". 27. Select "English (United States)", click "OK". 28. At welcome screen, click "Next" twice. 29. Select "I accept the terms in the license agreement", click "Next". 30. At "vCenter Server Information", next to "Username", type "Administrator". 31. Next to "Password", type Domain Administrator's password. 33. Select "Use and existing supported database", next to "Data Source Name (DSN)", select "VUMDB (MS SQL)". 38. Launch "Services" console, make sure "VMware vCenter Update Manager Service" is started.